41642-SS is rated 5.0 out of 5 by 2. 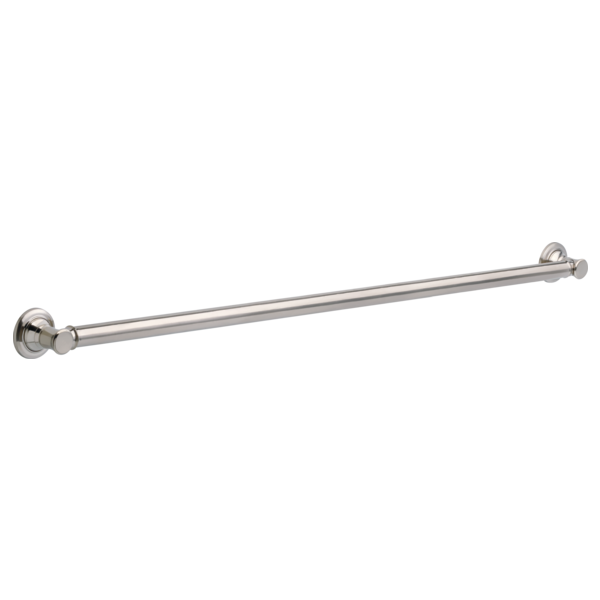 Your new grab bar coordinates with many Delta branded fixtures and competitive bath suites while offering an attractive safety feature in the bath. The wall anchor included with this grab bar provides a secure mount and, when properly installed, supports up to 500 pounds of force. That's twice the ADA requirement. Mounting on wood blocking behind all wall surfaces is preferable for additional security. Rated 5 out of 5 by Darrell from Nice upscale grab rail Most grab rails look basic. I needed something clean and stylish for a modern handicapped bath, this was the right product. Can any of your grab bars be cut to length? It looks like this model has endcaps that can be removed to allow the main bar to be sized. I would rather size the bar to fit existing wall studs than use the optional wall mount. Thank you. what is the grip like on this handle? What gauge steel is used for this grab bar. I could not find anything in your specifications, only the diameter. Thank you.